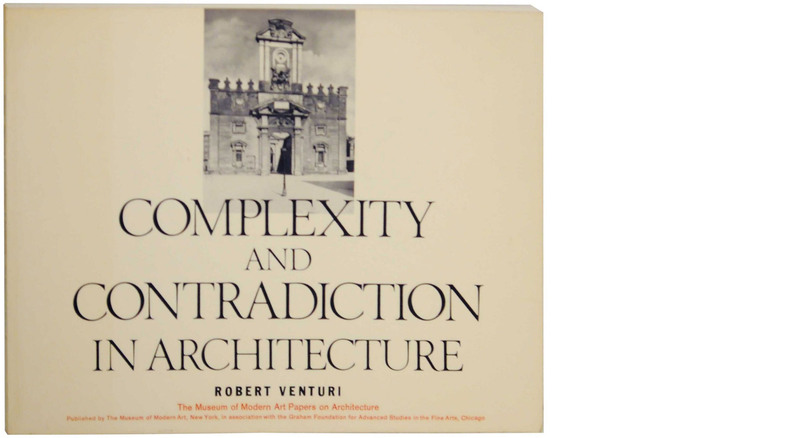 Robert Venturi, Complexity and Contradiction in Architecture (London: The Architectural Press, with the Museum of Modern Art, New York, 1977; or. ed., New York: The Museum of Art, 1966). While working at the Italian translation of LLV (done in collaboration with Venturis’ dear friend and colleague from Milan, the late Margherita Rossi Paulis), I had the privilege of getting to know up close Robert Venturi and Denise Scott Brown, who both thoroughly discussed and oversaw that edition of their book. I cannot underscore enough the intellectual and personal growth that their precious friendship, continued over the years after that endeavor,4 was able to offer me. Venturi was an incredibly pleasant person to be around, a gentleman of another era, whose polite and measured manners and bearing were in sharp contrast with the radicality of his ideas (not surprisingly, another example of “complexity and contradiction”…). Left: Robert Venturi, Denise Scott Brown and Steven Izenour, Learning from Las Vegas (Cambridge, MA, USA: The MIT Press, 1972 - or. ed.). 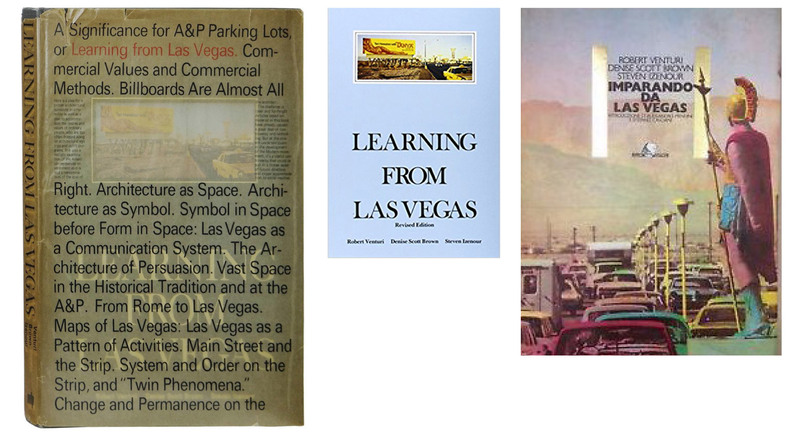 Center: Learning from Las Vegas (The MIT Press, 1977 - 2nd ed.). Right: Imparando da Las Vegas (Venice, It. : Cluva Editrice, 1985 - 1st Italian ed.). Through the many conversations we had, on and beyond the translation of the book, I was struck by his stunning knowledge of architectural history, the rapidity of his intellectual and aesthetic judgment (curiously akin to his quick way of sketching, typically with markers on trace), his genuine interest for any example of good architecture (beyond ideologies or over-constructed theories), be it by Michelangelo, John Soane, Alvar Aalto, or from the Italian countryside or the New England. Or by Giuseppe Vaccaro, whose church in Recoaro (Italy, 1951) - which Bob loved - I came to know during a memorable field trip that Bob and Denise wanted to take, along with a group of friends and younger colleagues (including Margherita and her husband and partner Franco Paulis, and Vaccaro’s daughter Carolina). The occasion was offered during one of their summer vacations that Bob and Denise used to spend in Venice in the mid-80s, with their son Jimmy. Through the richness of their works, Venturi and Scott Brown have been the catalysts for various strands of research in contemporary architecture, including, yes (though unwittingly) Post-Modernism, but also Critical Regionalism (another example of a “both-and” phenomenon, an aspect of architecture dear to VSB), or a growing interest into popular culture and the impact of architecture and urbanism on a global scale (hence, i.e., Rem Koolhaas’ continued interest in LLV 6). While Bob and Denise were uncomfortable with the “neo-Modernists,” superficially re-proposing in the second half of the twentieth century a formal vocabulary of architecture for a society and culture that had dramatically changed since the times of the Modern Movement, Venturi had a great admiration for the original Modernists. 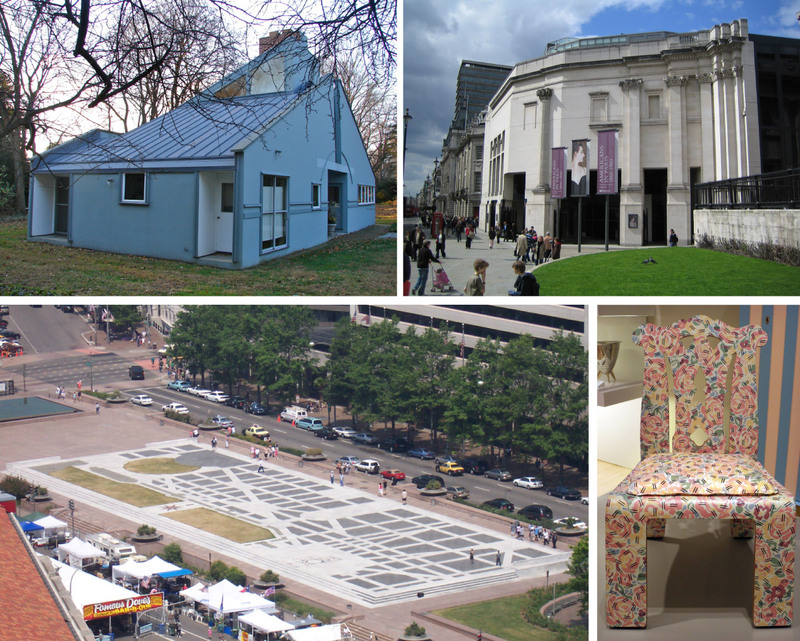 Clockwise, from top left: V&R, Vanna Venturi House, Chestnut Hill, Philadelphia, 1964; VRSB, Sainsbury Wing, National Gallery, London, 1991; VRSB, Knoll International Furniture Collection, Chippendale Chair with “Grandmother Motif,” 1984; VRSB, Freedom Plaza (formerly Western Plaza), Pennsylvania Avenue, Washington DC, 1980 - the realized version, while retaining the overall vision, somewhat departed from VRSB’s initial design. Robert Venturi, Iconography and Electronics upon a Generic Architecture (Cambridge, MA, USA: The MIT Press, 1996). VSBA, Whitehall Ferry Terminal (unbuilt), Lower Manhattan, New York, 1995. Consistently enough, his last important book Iconography and Electronics upon a Generic Architecture (1996),8 which is often overlooked, has further developed his ideas from the more famous books of the 60s and 70s. In what seems to be the logical conclusion of a trajectory of inquiry into the themes of form, symbolism and meaning, Venturi clarified his vision of “architecture as communication,” by drawing inspiration from the Byzantine mosaics (especially in Ravenna, Italy), which were used to communicate religious stories - actually one story, that one of the Catholic Church. Similarly, he argued, we can communicate now through electronic media the many stories and varied information of our multi-cultural, complex and pluralistic society. 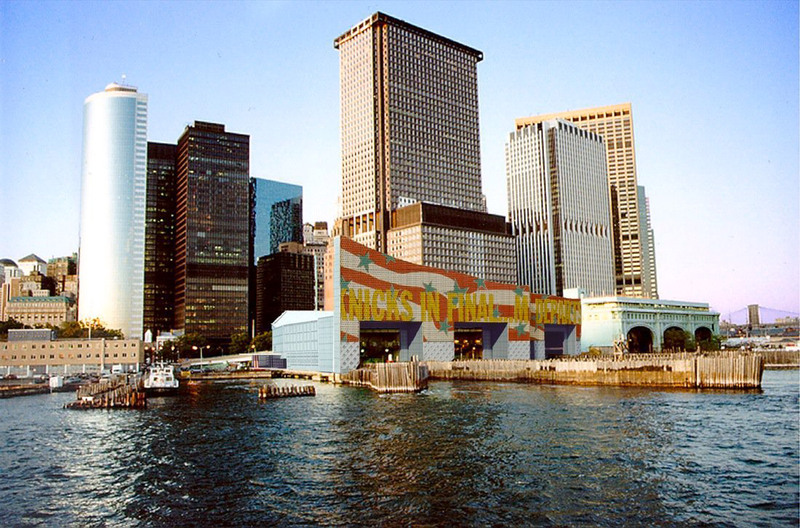 The VSBA project (unfortunately unbuilt) for the Whitehall Ferry Terminal in Lower Manhattan remains perhaps the most significant design expression of the ideas elaborated in I&E. From Rome (C&C), to Las Vegas (LLV), to Ravenna (I&E)… and back to New York. 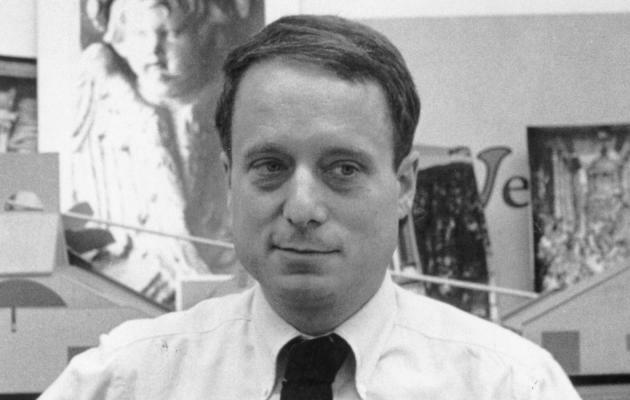 As I had the opportunity to write on the occasion of an exhibition on the Sainsbury Wing project at the Fondazione Masieri in Venice,10 I remember Robert Venturi stating clearly and simply (but profoundly) during a symposium held at Columbia University in April 1986: “more than anything, I want to be appropriate.” He wanted appropriately to be a Modern Mannerist (while calling us all to critically reflect and practice, in our own ways), for an architecture of communication in the post-modern era. And as such we should remember him and treasure his legacy. Vincent Scully, “Introduction,” in Robert Venturi, Complexity and Contradiction in Architecture (London: The Architectural Press, with the Museum of Modern Art, New York, 1977; or. ed., New York: The Museum of Art, 1966), 9. Venturi, Complexity and Contradiction, 104. Both Robert Venturi and Denise Scott Brown have always highly appreciated the first Italian edition of the book, which Venturi, in particular, did not want to be “outlandish” - that was the term that he insistently used, with his typical keen interest to always find the appropriate word to convey his ideas. Our thanks to Manuel Orazi of the publisher Quodlibet, Macerata (Italy), for having recently republished that Italian translation, although under a different graphic layout and a slightly different title: Imparare da Las Vegas, ed. Manuel Orazi (Macerata, It. : Quodlibet, 2010). Denise Scott Brown at the “Architecture after Las Vegas” symposium (January 21-23, 2010), on the occasion of the major retrospective exhibition “What We Learned: The Yale Las Vegas Studio and the Work of Venturi Scott Brown & Associates,” October 29, 2009 - February 5, 2010, School of Architecture, Yale University, New Haven, CT (USA). “Re-Learning from Las Vegas,” interview with Robert Venturi and Denise Scott Brown by Rem Koolhaas and Hans Ulrich Obrist, in AMOMA, Rem Koolhaas & Others, Content (Cologne, Ger. : Taschen, 2004), 150-57. 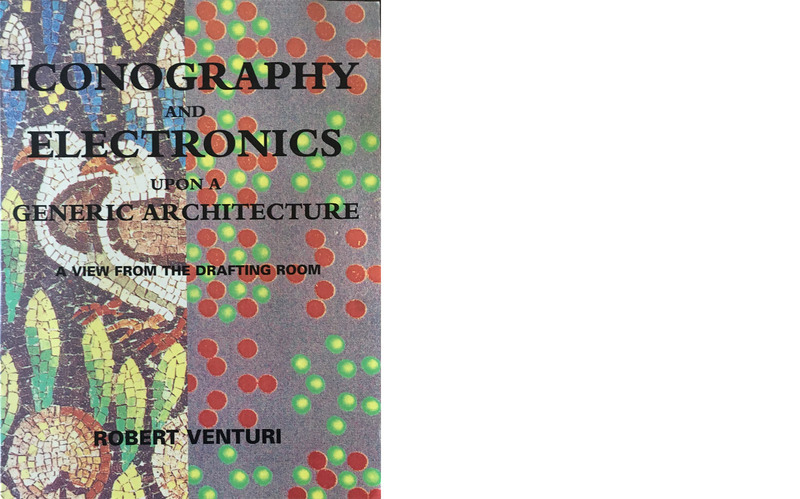 Robert Venturi, Iconography and Electronics upon a Generic Architecture (Cambridge, MA, USA: The MIT Press 1996). 9. See Robert Venturi, "A New Mannerism, for Architecture as Sign," in Robert Venturi & Denise Scott Brown, Architecture as Signs and Systems for a Mannerist Time (Cambridge, MA, USA: The Belknap Press of Harvard University Press, 2004), 73-100. The book, one of the latest writings by Venturi & Scott Brown, is based on the William E. Massey Sr. Lectures in the History of American Civilization that they both gave at Harvard in 2003. “Dall’ invenzione alla convenzione in architettura [From Invention to Convention in Architecture],” 3-9, transcript of a lecture on the Sainsbury Wing project, previously delivered, and Carolina Vaccaro’s “Tre musei di VRSB,” 10-12. The exhibition on the project. (which was just underway to be realized) ran from May 21, till July 2, 1988, and was co-curated by Evelina Francia and myself. Figures 1, 2, 4: Images by the Author. Figures 3 and 5: Images retrieved from Wikimedia Commons.